Is that a party in your pocket? It is now. The latest Joyetech offering is a massive dual 21700 mod with an LED light show and infinite mirror built in. Stare into the abyss while you ponder your life choices. Disclaimer: This product was sent to me for the purposes of review by Joyetech. I review all items for a minimum of 2 weeks daily use and do not embellish my opinions. Experiences are based on the mod received, how I vape, and may not be representative of all of the produced same devices. I’ve never been a fan of LED mods but if you have to get one why not go all out? The Infinite Conqueror kit is every vaping gimmick rolled into one ostentatious package. Mine appears to be a red anodized color with silver top, bottom, fire button, and screen surround. A large black screen covers the majority of one side and is a bit of a fingerprint magnet. The screen size is deceiving as the actual screen only takes up maybe 1/4 of the size. The rest is devoted to the infinity mirror and LEDs. Some angles are molded into the case and the back to assist with grip. The 510 is centered and the adjustment buttons for the mod are on the top, right in line to get juice splattered. The buttons don’t rattle but they do have some wobble when running my fingers over them. The ProCore Conqueror included in the kit mirrors the outlandish style of the mod. Bevels and castle-like edges surround the top and the bottom. A bubble glass was included that is also red tinted. The honeycomb drip tip is red as well completing the theme. How it Vapes – Like the regular Espion this mod seems to hit a little light. A few watts lower than what it reads. It suffers the same slight weakness of the Espion in that if you turn up the watts it heats or starts to burn but doesn’t compensate for the slower firing time. Not a huge deal but noticeable if you’re used to vaping on a fast firing mod like the Battlestar, Sirius, or Drag. TC is iffy in my experience. It didn’t kick me out out of TC when using a dual SS316L build but it seemed inconsistent. Some hits were alright and others were very weak. I haven’t had any issues with the 510 and it seems to be solid like the regular Espion. Batteries – With 21700 batteries you get a bit more time in between charges. When I’m vaping at 60 watts or so I need a little more umph to last the whole day. On board charging is available but I didn’t test it. I don’t advise relying on onboard charging with cheaper mods. The battery door is pretty secure but slightly difficult to open even with the ridges on the bottom. Screen – It’s too small. Given the size on the side of the mod and even the size of the middle portion the screen is tiny. Maybe I’m getting old but I find myself holding the mod close to my face just to read some of the finer detailed information. A large plastic covering encompasses most of the face and is prone to scratching and fingerprints. LEDs – Where the party is at. They’re so big you can’t ignore them. You can see them even if palmed in your hand. You can turn them off if you choose. You can select a specific color and pattern for the LEDs, of you can have a rainbow of colors flash and circle your screen. There is also the option for different effects like fire, or just for it to cycle through all the modes and colors randomly. You can have them on all the time as well or just when firing or after firing the mod with the screen timeout. Really it’s quite tailorable to what you want. Conqueror – I liked the past ProCore quite a bit for an included subohm tank. This one takes heavy inspiration from Smok tanks. Bright color, gaudy drip tip, bubble glass, and over designed exterior. It works well enough. I haven’t had any leaks and the coils last quite a while depending on your juice. A little extra capacity with the bubble glass. Drip tip is more secure on than it was on my ProCoreX. I do like that the extra angles on the outside make it super easy to adjust airflow and take the tank apart. It’s an average subohm tank which is more than I can typically say for the tanks included in kits. Mesh Coil – Included with the Conqueror was a new mesh coil. I’ve been curious to try them so I threw this in immediately. It’s not bad, but I’m not blown away. It feels a more airy and dry than the regular coils. Tolerable and decent flavor but I prefer the regular coils. Probably not a good measure of mesh coils overall. Battery Door – The door on the regular Espion is very tight and tends to stretch the edges of the battery wraps. The door on this one is great. Doesn’t open easy at all which is only a slight pain when you have to swap batteries. There are angles inset into the door to help you grip it but they’re shallow so they only help slightly. The door seems solid overall. It’s hard to say for sure, but I feel like if you’ve been considering this mod at all you’ll likely enjoy it. It takes a special person to appreciate the character of the Espion Infinite. Personally I enjoy it’s outlandishness but I am also not taking it anywhere or going to be seen with it anywhere. It’s a bit bulky to put in your pocket but it could be done. Battery life has been great and the function has been great in the month I've had it. My main concern is the top buttons and their exposure to liquid. TC isn’t fantastic but will get you by. I hope Joyetech puts some RnD into making their chips more accurate and faster firing. Their recent mods seem to be decent but they definitely could improve considerably in that department. Joyetech set out to make the most audacious LED mod to curb the competition and they succeeded. Not a terrible setup if you don’t mind being “that guy”. Not a bad “at home” dripper mod which is what I’ve been using it for primarily. More information is available at http://www.joyetech.com/product/espion-infinite-procore-conquer/. The Infinite is available in red, blue, gold, green, black, and dazzling and can be purchased for around $60-75 from a variety of vendors based on Vapecrawler. This just arrived in the mail. Interesting little device so far. I’m not aware of allergy concerns with the exterior of mods, but this one is supposedly hypoallergenic. It’s plastic with rubber covering all around. Internal battery mod. Very light, simple operation, and menu system. The tank uses notch coils that are pre-wicked. You just press them into a slot and you’re done. I’ve had one atomizer error so far. I liked Notch coils when they were a thing for a short time when I was using 26-28g kanthal primarily. These seem to be alright so far but are small coils and suitable for 50w or less. Regardless, I’ll be using it the next few weeks to see how it goes before posting a review. Is that a party in your pocket? It is now. The latest Joyetech offering is a massive dual 21700 mod with an LED light show and infinite mirror built in. 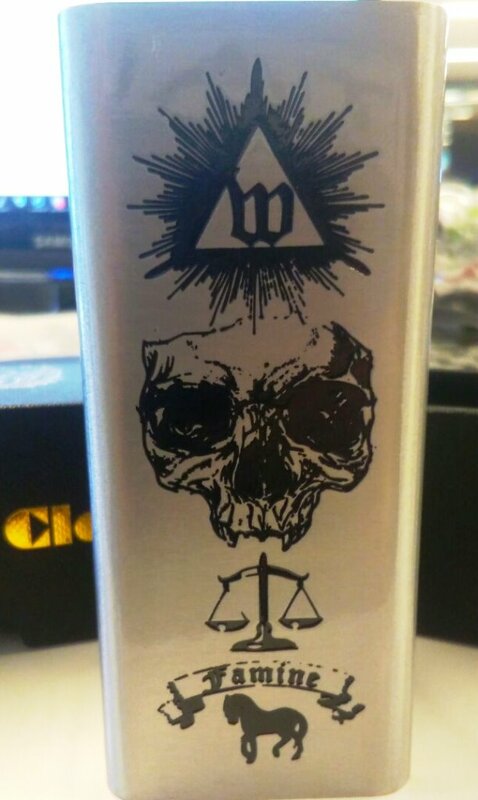 Stare into the abyss while you ponder your life choices.Disclaimer: This product was sent to me for the purposes of review by Joyetech. I review all items for a minimum of 2 weeks daily use and do not embellish my opinions. Experiences are based on the mod received, how I vape, and may not be representative of all of the produced same devices.Note: I’ve been vaping for 4 years. My vaping style currently varies between RTAs and RDAs, 24-26g Kanthal and SS316L typically between 40 and 70 watts on regulated mods. In addition to the mod reviewed I’ve been using a Battlestar and Dead RabbitAppearanceAlbumI’ve never been a fan of LED mods but if you have to get one why not go all out? The Infinite Conqueror kit is every vaping gimmick rolled into one ostentatious package.Mine appears to be a red anodized color with silver top, bottom, fire button, and screen surround. A large black screen covers the majority of one side and is a bit of a fingerprint magnet. The screen size is deceiving as the actual screen only takes up maybe 1/4 of the size. The rest is devoted to the infinity mirror and LEDs. Some angles are molded into the case and the back to assist with grip.The 510 is centered and the adjustment buttons for the mod are on the top, right in line to get juice splattered. The buttons don’t rattle but they do have some wobble when running my fingers over them.The ProCore Conqueror included in the kit mirrors the outlandish style of the mod. Bevels and castle-like edges surround the top and the bottom. A bubble glass was included that is also red tinted. The honeycomb drip tip is red as well completing the theme.FunctionHow it Vapes – Like the regular Espion this mod seems to hit a little light. A few watts lower than what it reads. It suffers the same slight weakness of the Espion in that if you turn up the watts it heats or starts to burn but doesn’t compensate for the slower firing time. Not a huge deal but noticeable if you’re used to vaping on a fast firing mod like the Battlestar, Sirius, or Drag. TC is iffy in my experience. It didn’t kick me out out of TC when using a dual SS316L build but it seemed inconsistent. Some hits were alright and others were very weak. I haven’t had any issues with the 510 and it seems to be solid like the regular Espion.Batteries – With 21700 batteries you get a bit more time in between charges. When I’m vaping at 60 watts or so I need a little more umph to last the whole day. On board charging is available but I didn’t test it. I don’t advise relying on onboard charging with cheaper mods. The battery door is pretty secure but slightly difficult to open even with the ridges on the bottom.Screen – It’s too small. Given the size on the side of the mod and even the size of the middle portion the screen is tiny. Maybe I’m getting old but I find myself holding the mod close to my face just to read some of the finer detailed information. A large plastic covering encompasses most of the face and is prone to scratching and fingerprints.LEDs – Where the party is at. They’re so big you can’t ignore them. You can see them even if palmed in your hand. You can turn them off if you choose. You can select a specific color and pattern for the LEDs, of you can have a rainbow of colors flash and circle your screen. There is also the option for different effects like fire, or just for it to cycle through all the modes and colors randomly. You can have them on all the time as well or just when firing or after firing the mod with the screen timeout. Really it’s quite tailorable to what you want.Conqueror – I liked the past ProCore quite a bit for an included subohm tank. This one takes heavy inspiration from Smok tanks. Bright color, gaudy drip tip, bubble glass, and over designed exterior. It works well enough. I haven’t had any leaks and the coils last quite a while depending on your juice. A little extra capacity with the bubble glass. Drip tip is more secure on than it was on my ProCoreX. I do like that the extra angles on the outside make it super easy to adjust airflow and take the tank apart. It’s an average subohm tank which is more than I can typically say for the tanks included in kits.Mesh Coil – Included with the Conqueror was a new mesh coil. I’ve been curious to try them so I threw this in immediately. It’s not bad, but I’m not blown away. It feels a more airy and dry than the regular coils. Tolerable and decent flavor but I prefer the regular coils. Probably not a good measure of mesh coils overall.Battery Door – The door on the regular Espion is very tight and tends to stretch the edges of the battery wraps. The door on this one is great. Doesn’t open easy at all which is only a slight pain when you have to swap batteries. There are angles inset into the door to help you grip it but they’re shallow so they only help slightly. The door seems solid overall.ProsMesmerizing LED light show and infinite mirror21700 BatteriesPre-heat, Clock, TCRGood center 510Metal constructionConqueror tank is decentCan turn off LED light showConsIt’s sillySmall screen can be hard to read, large cover prone to fingerprints/scratchesTop buttons exposed to liquidQuite largeTC is iffySummaryIt’s hard to say for sure, but I feel like if you’ve been considering this mod at all you’ll likely enjoy it. It takes a special person to appreciate the character of the Espion Infinite. Personally I enjoy it’s outlandishness but I am also not taking it anywhere or going to be seen with it anywhere. It’s a bit bulky to put in your pocket but it could be done. Battery life has been great and the function has been great in the month I’ve had it. My main concern is the top buttons and their exposure to liquid. TC isn’t fantastic but will get you by. I hope Joyetech puts some RnD into making their chips more accurate and faster firing. Their recent mods seem to be decent but they definitely could improve considerably in that department. Joyetech set out to make the most audacious LED mod to curb the competition and they succeeded. Not a terrible setup if you don’t mind being “that guy”. Not a bad “at home” dripper mod which is what I’ve been using it for primarily.More information is available at https://ift.tt/2HdLuST. The Infinite is available in red, blue, gold, green, black, and dazzling and can be purchased for around $60-75 from a variety of vendors based on Vapecrawler.Espion SilkThis just arrived in the mail. Interesting little device so far. I’m not aware of allergy concerns with the exterior of mods, but this one is supposedly hypoallergenic. It’s plastic with rubber covering all around. Internal battery mod. Very light, simple operation, and menu system. The tank uses notch coils that are pre-wicked. You just press them into a slot and you’re done. I’ve had one atomizer error so far. I liked Notch coils when they were a thing for a short time when I was using 26-28g kanthal primarily. These seem to be alright so far but are small coils and suitable for 50w or less. Regardless, I’ll be using it the next few weeks to see how it goes before posting a review.